The planet Orban is anxious to exchange knowledge with Earth, however it is the children of Orban who are capable of learning and passing on knowledge. When Merrin, a young Orbanian girl, comes to Earth to teach about a naquadah reactor, SG-1 is horrified to learn the truth behind her intelligence. Artificial nanites in her system acquire knowledge, and their removal will leave her nearly vegetative. O'Neill defies orders to take Merrin off base, trying to convince her to leave Orban, but although Merrin does return home, she changes the fate of her people in a way no one expected. Earth and Orban participate in an exchange in which Carter obtains the technology for a naquadah reactor, Daniel studies the archaeological origins of the planet, and Teal'c shares information about the Goa'uld. Daniel found archaeological evidence, including a pyramid, mosaics, and a figure of Chalchiutlicue, the Aztec goddess of water, suggesting connections to Teotihuacan, a city in pre-Columbian South America, bigger than ancient Rome. It flourished for centuries as a religious and economic mecca before suffering a great upheaval in 750 AD, which may have been caused by the Goa'uld. The Orbanians may be descendants of this civilization which pre-dates the Aztecs. The Goa'uld were on Orban in the last few hundred years, but it is unknown why they left. Merrin's blood contains traces of silicon, trinium, and an unknown element, abnormally high neuropeptide levels, as well as millions of nanites in her brain. The nanites were created by Orbanians 49 years ago as a means of acquiring knowledge. Children such as Merrin, Zaren, Solen, and Kalan's son Tomin, are selected to be Urrone and are given millions of nanites at birth, before neural pathways are established, enabling them to learn vast amounts of information very quickly. 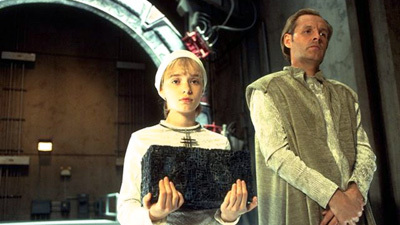 At age 12, Urrone children undergo the Averium ceremony in which the nanites are removed and each citizen receives a nanite by injection, allowing the knowledge to be passed on. Past-Urrone children cannot receive new nanites because the brain rejects them, so their previous knowledge is lost. Cassandra is now in junior high school. O'Neill has kept in touch with her previous school.